A veiled chameleon extends its tongue to catch a cricket. Canadian wildlife photographer Scott Linstead, formerly an aerospace engineer and high school teacher, uses a device called Phototrap "to not only photograph the elusive, but also the unimaginably quick." Phototrap "interfaces with either your camera or your flash," he says, and it basically helps "trigger the shutter of your camera when the photographic subject passes through a defined position in space." 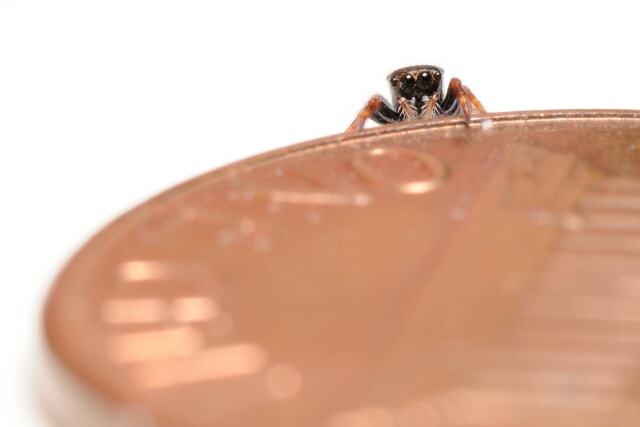 If this were a Hollywood movie set, you might think the spiderling was making its way onto a gigantic faux penny. Not so. It's a real penny, and the details we can see in the little creature -- including its eyes and furry legs -- are amazing. In the first photo, left, a predatory archer fish displaces a cricket from its perch over the waterline by squirting a jet of water. In the photo on the right, the fish breaches to devour the cricket. Most of us are used to seeing photos of ladybugs, like the one on the left -- the familiar red-and-black round shell, and not much else. Linstead brings us a different dimension of the ladybug with the one on the right. While the photo looks like it was taken outdoors, he took the shot in a studio. The beetles are drawn to light, he says, so he used a light source on a flower, but kept the light off until he was ready to take the photograph. "There are situations where eye contact simply does not work to an image’s advantage," he says. "As photogenic as a ladybug can be while crawling on a leaf, in flight they appear rather awkward. The eye as well as the rest of the head is difficult to locate among the clutter of appendages. Their pleasingly symmetric shape transforms into a jagged array of wings, carapace halves, legs and the abdomen." Talk about up close and personal: This female regal "orange morph" jumping spider jumped directly onto Linstead's camera lens. Floridian jumping spiders, says Linstead, "have these huge, forward-facing eyes, and although they have three more pairs of eyes that account for peripheral vision, once they detect movement, they tend to direct that largest pair at the source. This creates the impression that they are trying to engage us in eye contact." Florida isn't the only place to find these spiders, Linstead says, but the state's "native species are large and colorful." Blue Jays "can easily be lured into an outdoor photo set-up by leaving their favorite snack out: peanuts," says Linstead. This shot of a Green frog represents one of Linstead's "earliest studio attempts with a local species." This beautiful owl was photographed in Ontario, Canada during a heavy snowstorm. The Brown Basilisk is also referred to as the "Jesus Lizard," "Jesus Christ Lizard" or "Lagarto de Jesus Cristo" for its ability to run on the surface of water. When the lizards flee from predators, they gather sufficient momentum to run across the water for a brief distance while holding most of their body out of the water. "The osprey image was a personal obsession of mine," Linstead says. "I had the rare opportunity to spend four days in a tiny hide at the edge of a pond in Finland. This location near Tampere is arguably the best spot on earth to photograph this behavior." In a move you'd see at a Cirque du Soleil show, this female regal jumping spider moves with ease, as captured by Linstead. "The left-to-right jumps are considerably easier to photograph than the head-on ones," he says. "Unfortunately this perspective lacks the eye contact that gives this species its charm." This was another studio image "birthed out of the desire to have full control over the habitat and lighting for an insect flight shot," Linstead says. "The image was produced on my kitchen table."